Toys. My children have so many toys. It is baffling. They are given toys (by generous and loving family members and friends) for every holiday and occasion. While I know the intent is good, it just adds up to too much stuff. I try to go through their things as often as possible. I donate any unused toys that are in good repair. I also "rest" toys throughout the year. When my daughter becomes sick of something that she normally loves, I put it away. When I bring it out again in a month, she is generally thrilled to play with it again. If she isn't, the toy is donated to someone who will use it. My before picture isn't too disastrous looking. What you aren't seeing is the MASSIVE fort that my husband built with my daughter. She has been squirreling toys away in her "house" and things had gotten out of hand. 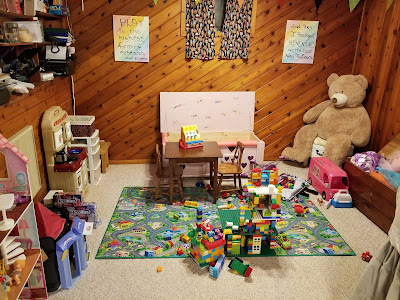 I dismantled the fort and dug out all of my daughter's treasures. 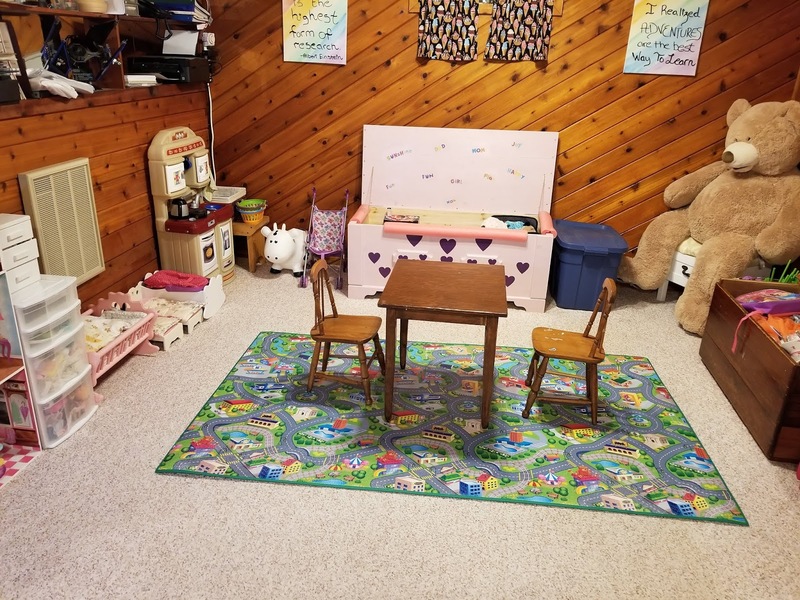 I rested a box of toys, donated several items, and then rearranged the playroom a bit. If it is broken or severely maimed, let it go. If you aren't sure if your child will actually miss a toy, hide it for a little while. If they don't ask for it in a few weeks, donate it. Less is more. My daughter plays well when there is less to choose from. Choice can be overwhelming for children. If they have too much to choose from they will likely tear apart the playroom without actually getting into imaginative play. Toys need a designated home. Our kids don't keep toys in their rooms. We have designated the living room for baby toys and the playroom for all of the other toys. When items have a home, they can be easily returned to it when playtime is over.